I had an interesting talk with my dear friend over the phone yesterday. 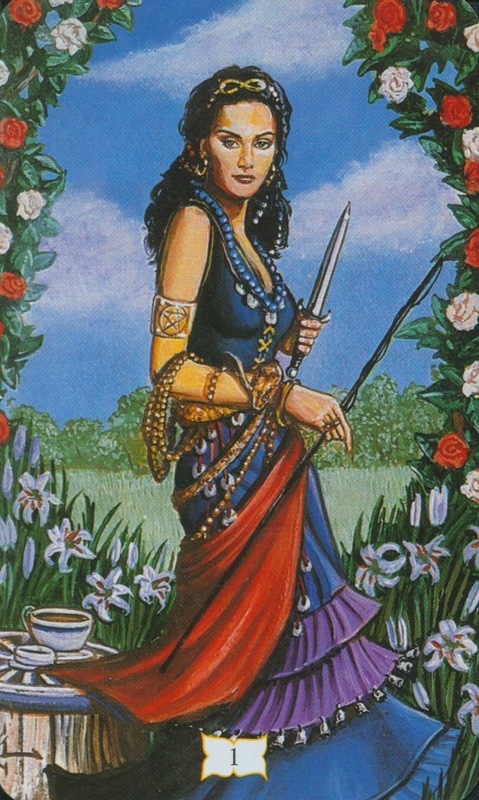 She is a seeker who has quite a lovely unfolding relationship with a Norse goddess. Like oh so many others she worries quite a lot about the possibility that external forces might influence her or threaten her in some way. She feels vulnerable and not in control. Plus she overthinks everything! That’s like her speciality. So I conclude two things: she doesn’t really trust her intuition and she doesn’t recognize or connect to her own power. I may not be the most self assured person on this planet, far from it! I frequently feel socially awkward, uncapable of mundane tasks etc. But having spent a lot of time and effort navigating the inner planes I’m sort of familiar there now. I know I am in control there. I try to remember how I experienced it when I started out all those years ago… Maybe my first taste of it was when my mother did guided visualisation with me as a little girl, trying to relieve some of my anxiety to help me fall asleep. It is still so vivid in my mind, me and my black horse on a green summer field. I had a backpack (probably with cookies in it) and a yellow dress. I don’t think I’ve ever owned a yellow dress in real life, but perhaps it was another trick to try and brighten my mood. It kinda worked. It opened up to me the idea that on the mental plane I was in charge and I could create the reality that I wanted, more or less, and sometimes it could even spill over into outside reality. As I grew older I continued to experiment and I got interested in the occult and practices like meditation and magick. 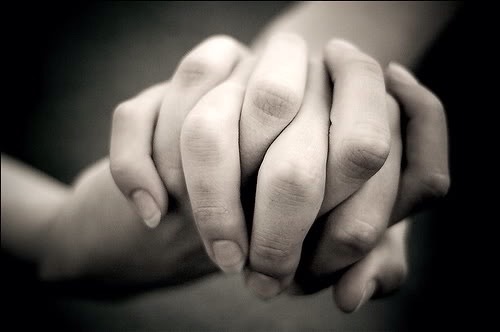 When I came across my first teacher he talked quite extensively about protection and spiritual hygiene. One of the most important things he imparted was that the belief that someone could harm you was the most devastating of all. It was/is very possible that someone can do you harm, but I have consciously remained quite thick headed about it and not even made it an option for it to impact me. That goes for humans as well as spirits by the way. Instead I chose to view myself as a cast circle, whole and incorruptable. I am a microcosmos of all the power in the universe and can not be shaken. I think that one must become very self aware, know thyself! If you know what you are and what you are not, it’s more easy to draw lines to keep negative influence at bay. Learn what thoughts are yours (this is also where you have to listen to your deep intuition) and what thoughts come from outside of yourself. To speak clear, learn to distinguish where you begin and where you end, what are conventions, fears or other disturbances and what is truly genuine. Well, that’s it for tonight. It’s late and I gotta rise early. Take care! 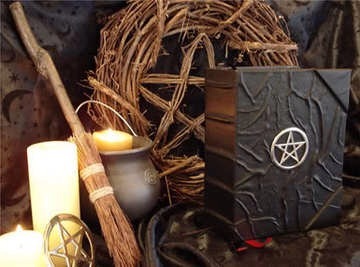 This morning I listened to an interview on youtube with Maxine Sanders, co-founder of the Alexandrian tradition of Wicca. 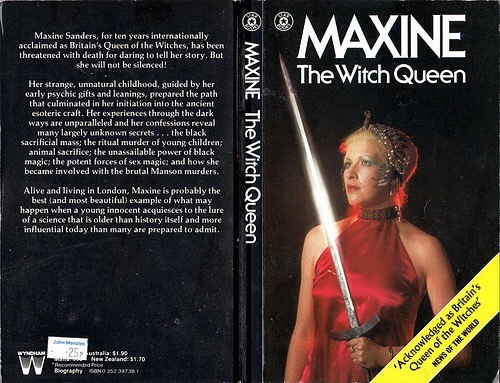 In my witchy beginnings I was assigned to read her book Maxine: the Witch Queen from 1976. That was the first time I’d heard of her. I found the interview very interesting and thought provocing. Maxine is an intriguing woman and witch. What really shone through for me was Maxine the priestess. She spoke with integrity, honor and sincerity and you could hear that she loves the Craft. It awoke a newfound admiration for her in me. It also made me question things about my own practice, sadly in a negative way. But probably it’s because of my general mood today. I started thinking that I don’t practice enough, that I’m not good enough and will never possess the qualities or experience to lead a group. I am not articulate enough to even pin point my believes or theories. But something inside me whispers in a small voice. It says that these insecurities and fears can turn into advantages. I just have a different flavor and I need to find my own voice, my unique style. I shouldn’t sell myself short. I am on this path and I strive to be the best self I can be. We all have our difficulties but we are all good enough. Long time since I wrote anything at all. I have a blog where I write in my native language too, but I’m actually more drawn to write here for some reason. Summer has arrived, mostly with rain. The coven is taking a summer break and I miss hanging out. I don’t miss the travelling though, since it’s about four hours in total. But heck, it’s totally worth it! The last ritual was held elsewhere, and when we returned to the apartment we made some tea and watched the sky grow lighter while we talked. It was a wonderful, calm closure. So relaxed and friendly. I always stay over at ritual nights, and it’s amazing to be able to sit and talk in peace without having to rush to the train. The conversations usually run quite deep then. The downside of coven life for me has been the feeling that I’m failing my own practice. Before I met this group I was loosely part of another coven. In fact, it wasn’t I who was loose but rather the coven as a whole. That meant I had lots of time to form my own practice, and so I did. Especially the year 2011 was a very productive year for me when I re-wrote, experimented and practiced a lot, especially at esbats. That year I had my most intense moment in ritual (at an esbat), that has since been what I strive for. But the gods chose their moments with or without us, it seems! Anyway, given the choise I would definately practice with a coven rather than without. It’s so rewarding for me on so many levels. I wouldn’t change it or trade it. But I need to get my own stuff together again. I’ve become lazy and I’m loosing touch with my own ways, my own sovereignty in circle. It takes more of you to hold the circle on your own, to keep focus all the time, because there’s no one there to back you up. It requires somewhat different skills than coven work. And as much as coven rituals are lovely, I don’t think they can get me to where I was in 2011, that sort of thing is between you and the gods.